BY SEBASTIÁN ENCINA, Museum Collections Manager, Kelsey Museum of Archaeology. Encina earned a BA degree in anthropology/history from St. John Fisher College, Rochester, NY; an MA in anthropology from George Washington University, Washington DC; and an MSI from the University of Michigan. Favorite Artifact. An artist’s sketch slab. Limestone with red and black ink. Dynasty 19–20 (ca. 1303–1085 BCE). Bequest, Mrs. Irene Goudsmit. KM 1981.4.18. Why. “Sketch slabs remind us that not all ancient art is a finished product. Even the greatest artists had to practice or sketch their ideas before they executed and finalized a piece of art. This particular slab shows the hand of an artist who may have gone on to create wonderful art in a tomb, but this particular object was never intended to be on display or viewed as a work of art. It was mere practice to hone the artist’s talent or vision prior to creating the actual final piece of art. About Artifact. 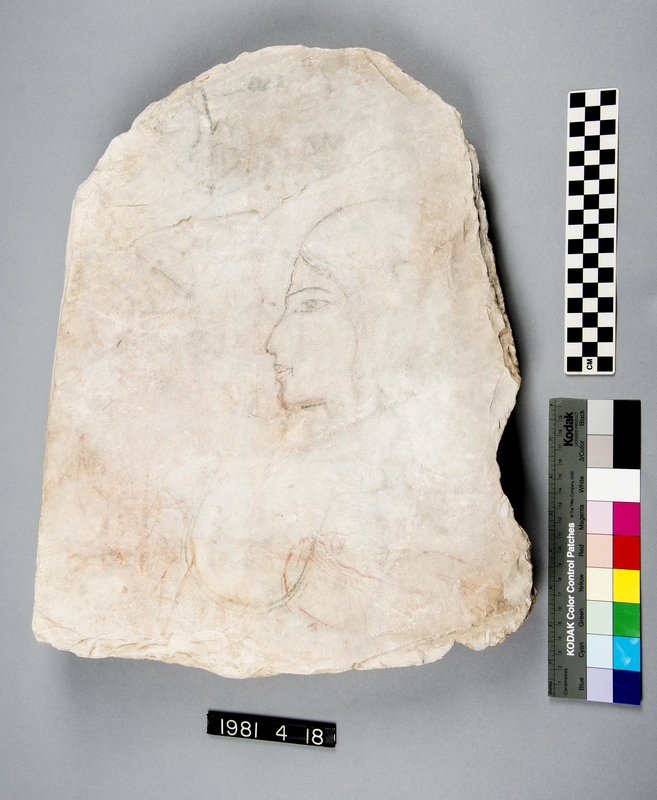 This sketch slab preserves a royal Ramesside profile, with two beautiful studies of females superimposed. Vestiges of a lion’s head and a human arm are visible in the lower left, while traces of a hieratic notation appear very near the top. Background. Different artists had different roles: one would draw, one would outline, and another would add color. Find It. This artist’s sketch slab is not on display in the museum’s permanent exhibition, but it is scheduled to be exhibited in the Kelsey’s special exhibition Passionate Curiosities: Collecting in Egypt and the Near East, 1880s–1950s, open August 28 through November 29, 2015. Learn More. The exhibition catalog, Passionate Curiosities: Tales of Collectors and Collections from the Kelsey Museum, by Lauren E. Talalay and Margaret Cool Root — will be available for purchase in the Kelsey gift shop and online from ISD. Favorite Artifact: Description de l’Égypte. Paper, pigment, leather binding. Deluxe first edition. Published 1809–1822 in Paris. Bound by Rowfant Bindery in Cleveland, Ohio, 1912–1914. KM 2003.4.1a–w. Why: “One of my co-workers described the Description de l’Égypte volumes as ‘coffee table books on steroids!’ I love books so when Sebastián Encina, Museum Collections Manager, first showed them to me, I had to agree! Their size is very impressive, as is the sheer vibrant color of many of the illustrations. Plus, the Kelsey’s set is a deluxe first edition. About Artifact: Description de l’Égypte is an amazingly detailed description of Egypt’s past and then-present. Editor François Jomard based the content on material collected by a scientific commission of approximately 175 scholars, appointed by Napoleon to accompany his 1798 expedition to Egypt. There, he directed the scholars to study all of Egypt. The Kelsey’s set includes 23 volumes: 10 with text and 13 with illustrations (including 3 elephant folios), many in color. Published from 1809 to 1829, Description pages were sold individually, mainly to financially well-off people. Owners later arranged to have their pages bound into books. The Kelsey’s pages were published 1809 through 1822. Left: Volumes of the Description de l’Égypte in their storage drawer in the Kelsey Museum; right: Collections Manager Sebastián Encina displays an elephant folio. The scientific commission included engineers, mechanics, surveyors, cartographers, interpreters, printers, architects, surgeons, pharmacists, physicists, chemists, mathematicians, astronomers, geologists, zoologists, archaeologists, economists, artists, musicians, and poets, according to historian J. Christopher Herold in The Age of Napoleon. Once in Cairo, the scientific commission established the Institute of Egypt and a headquarters on the edge of the city. Before them lay a massive undertaking. They set up a library, laboratories, workshops, observatory, museum, zoological and botanical collections, aviary, agricultural-experiment station, artists’ studios, printing plant, living quarters, and a meeting hall, all to support and process their research findings. Two illustrations from the Description de l’Égypte: on the left, an asp; on the right, ibis mummies and other mummy fragments. Artifact Source: In 1953, Dr. Otto O. Fisher gave the Kelsey a complete deluxe first edition of Description de l’Égypte. Fisher was a surgeon who interned at Detroit’s Henry Ford Hospital in 1922–23 and then practiced in Detroit. According to Kelsey Curator Emerita Lauren Talalay, Fisher was an avid bibliophile, whose collection of rare books and documents at one time numbered more than 20,000. Talalay said he gave Description to the Kelsey in exchange for his recall of the Fisher Papyrus (an impressive copy of the Egyptian Book of the Dead), which he had lent to the museum on a long-term basis but eventually wished to sell. Background: Napoleon I left Toulon, France, in 1798 with a fleet of 328 vessels, carrying 38,000 men headed for Egypt. He intended a world-conquering expedition (such as Alexander the Great’s), which he initially expected to push as far east as India. Napoleon did capture Egypt for about a year. But, in the end, he was defeated and fled Egypt in 1799. Many of his soldiers and scholars, however, remained for another year. One of Napoleon’s soldiers found a stela of polished black basalt with inscriptions in three different forms of writing. This was the famous Rosetta Stone, now housed in the British Museum (the British having defeated the French in Egypt). Although many of the artifacts found by the French eventually had to be turned over to Britain, the French retained all the drawings and descriptions of Egypt that they had completed, taking them back to France and eventually producing the Description. Find It: Currently, none of the Kelsey’s Description de l’Égypte volumes are on exhibit, but at least one volume will be part of a special exhibition — “Passionate Curiosities: Collecting in Egypt and the Near East, 1880s–1950s” (August 28–November 29, 2015) — to be curated by Margaret Cool Root. Scholars may inquire about the books from Museum Collections Manager Sebastián Encina at sencina@umich.edu. Learn More: Currently scheduled for publication in late 2015: Passionate Curiosities: Tales of Collectors & Collections from the Kelsey Museum by Lauren E. Talalay and Margaret Cool Root. To be available for purchase in the Kelsey Gift Shop and online from ISD. View an online edition of Description de l’Égypte here. False door panel of Qar. BY TINA SMITH, Volunteer docent and member of Kelsey Board of Members. Smith is a long-time docent who has been active in nearly every activity at the museum. She holds three degrees: a BA in biology from Mount Holyoke College, an MS in biology from Brown University, and an MS in natural resources planning and conservation from the University of Michigan. Favorite Artifact: False door panel of Qar, also known as Pepy-nefer. Limestone, paint. 6th Dynasty (2407–2260 BC). Egypt. KM 1981.4.1. Detail of the false door panel of Qar. Why: “It’s great fun to work with when I give gallery tours. For example, I point out the man’s picture and use it to talk about ancient Egyptian art. I ask the children to pose like the “photo ID.” I have them try to look at me while at the same time keeping their heads in profile as in the ancient Egyptian way of drawing people. Much stretching, wiggling, and contortions ensue as the children attempt Egyptian poses. It’s an attention-getter, and I can then tell them about the ancient Egyptian rules of drawing the human body using a grid to divide the body into three portions, a system devised during the 5th Dynasty (about 2500 BC). This leads me to explain who Osiris was and how he became god of the Underworld, the process of mummification, and how ancient Egyptians buried their dead in tomb shafts with false doors to trick tomb raiders. And how the sun had barely set on the funeral proceedings before they arrived to steal the grave goods, despite all the precautions taken to hide the burial chamber. And then there are all those wonderful hieroglyphs that enable me to discuss writing, the significance of the Rosetta Stone, and the realization that ancient Egyptian was a syllabic language and that no one has ever heard it spoken. One can use that false door panel to talk about so much! About Artifact: The false door panel of Qar is from his tomb at Saqqara in northern Egypt, which was equipped with several false doors, each a focal point for offerings to his ka. This panel, which formed the left jamb of one of these doors, depicts Qar holding a staff and scepter of authority, markers of his governmental role as chief magistrate. Qar’s nickname — Pepy-Nefer — incorporates the name of the reigning king, Pepy I, and reinforces the notion of royal favor attached to the location of his tomb in the court cemetery of his time. Background: In addition to building elaborate tombs in prestigious cemeteries, elite officials of the Old Kingdom expressed status and identity in their tombs by emphasizing ties to the king and through the extensive use of hieroglyphic text in the decorative schemes of their chapels. Access to this sacred script was extremely limited at this time, and its use signaled both privilege and literacy, a highly regarded personal achievement. Find It: On the first floor of the William E. Upjohn Exhibit Wing, find the Djehutymose coffin. On the left-hand side of the wall called “Place, Proximity, and Literacy in Old Kingdom” (directly across from the coffin) you’ll find the false door of Qar. Learn More: Society and Death in Ancient Egypt: Landscapes of the Middle Kingdom, by Janet Richards, Kelsey Curator of Dynastic Egypt Collections. Published in 2005 by Cambridge University Press, the book is available in hardcover or paperback through Amazon.com. BY DAWN JOHNSON, Associate Director, Kelsey Museum of Archaeology, University of Michigan. Why. “I saw this hawk mummy on my first tour of the museum’s collections in storage. A different hawk mummy is on display in our permanent collections that I also like. But I’m a very visual person, so this hawk mummy’s distinctive beak profile and vigilant turn of head formed a beautiful line that caught my eye immediately. The linen bandages seem to wrap around its head like a cloak. 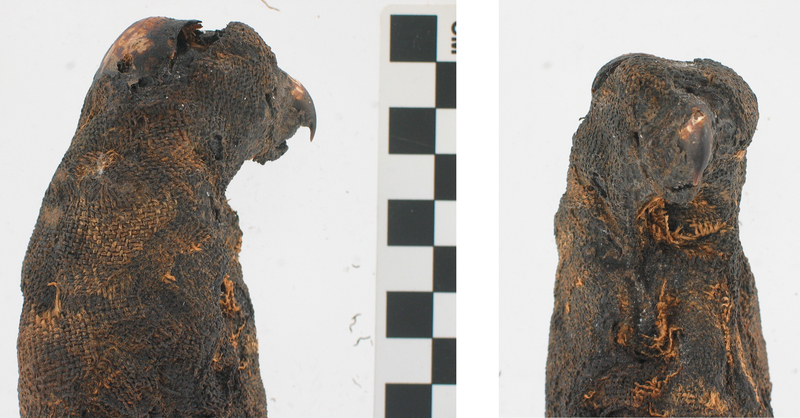 Although currently not on public exhibit, this hawk mummy last appeared in the Kelsey’s Conserving Antiquity special exhibition from November 2, 2012 to February 10, 2013. A picture of it appears in the Kelsey publication Life, Death, and Afterlife in Ancient Egypt: The Djehutymose Coffin in the Kelsey Museum of Archaeology by T. G. Wilfong (figure 12). Background. One distinctive feature of Egyptian religion is the association of gods with animals. Temples often featured animal cults, in which an animal was revered as a symbol of a particular god. Animal cult centers, such as the temples of crocodile gods at Karanis and Soknopaiou Nesos, became pilgrimage and tourist destinations, with cemeteries where cult animals would be mummified and buried as offerings. Greek and Roman visitors were baffled by what they saw as animal worship in Egypt but failed to understand the complex relationship between god and animal in Egyptian thought. Animal cults had roots in Egyptian prehistory and survived well after the introduction of Christianity into Egypt; the last known animal cult in Egypt was active up to AD 340, and others may have persisted longer. Find It. Currently, this particular hawk mummy is not on public exhibit. Scholars may inquire for more information from Museum Collections Coordinator Sebastián Encina at sencina@umich.edu. However, another hawk mummy is on exhibit on the first floor of the William E. Upjohn Exhibit Wing. To find it, look for the statue of the seated priest near the stairway to the second floor. From there, go left one exhibit case. Then turn right to face the case. It’s in the lower third of the exhibit. Learn More. Life, Death, and Afterlife in Ancient Egypt: The Djehutymose Coffin in the Kelsey Museum of Archaeology, by T. G. Wilfong. BY ANN VAN ROSEVELT, Adjunct Research Scientist Emeritus, Kelsey Museum of Archaeology. Her learned background includes a BA in classical studies in English from Vassar College and three MA degrees in classical studies, museum procedures, and classical archaeology from the University of Michigan. Associated with the Kelsey for nearly 50 years, currently as a volunteer docent. Favorite Artifact: Sculpture of a lion. Limestone. Roman period (1st–4th century AD). Karanis, Egypt. KM 25785. U-M Excavations, 1924–1935. 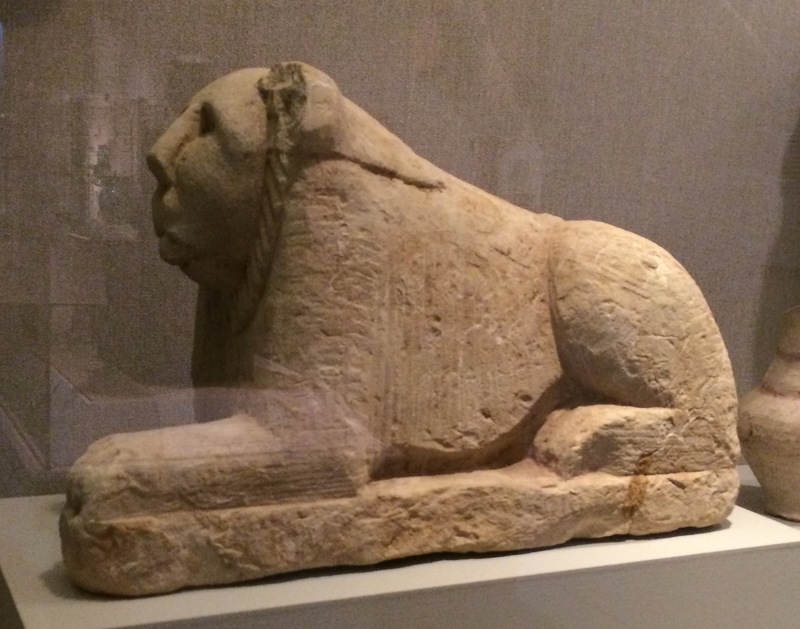 About Artifact: One of many sculptures that University of Michigan archaeologists uncovered at Karanis during its 1924–1935 excavations, this sculpture of a lion appeared in Curator Elaine Gazda’s 1978 Kelsey exhibition Guardians of the Nile: Sculptures from Karanis in the Fayum (c. 250 BC–AD 450). Background. According to Kelsey curator T. G. Wilfong, Karanis was a town in Egypt’s Fayum region, founded around 250 BC to house a population meant to work newly reclaimed agricultural land. It was a farming community with a diverse population and a complex material culture that lasted for hundreds of years after its foundation. Ultimately abandoned by its inhabitants and partly covered by the encroaching desert, Karanis eventually proved to be an extraordinarily rich archaeological site, yielding thousands of artifacts and texts on papyrus that provide a wealth of information about daily life in the Roman-period Egyptian town. The University of Michigan excavated at Karanis from 1924 to 1935, and during these seasons the Egyptian government granted nearly 45,000 of the artifacts discovered to the University of Michigan. Along with extensive archival records and photographs of the excavation, the Karanis material forms one of the major components of the collection of the Kelsey Museum of Archaeology. Find It. On the first floor of the William E. Upjohn Exhibit Wing, look for the statue of the seated priest near the stairway to the second floor. You’ll find the sculpture of a lion in the exhibit case right behind the seated priest on the left. Learn More. A number of books about U-M’s Karanis excavations are available in our Gift Shop, or online from ISD, including: Karanis: An Egyptian Town in Roman Times; Discoveries of the University of Michigan Excavation to Egypt (1924-1935), edited by Elaine K. Gazda with new preface and updated bibliography by T. G. Wilfong. BY CATHERINE PERSON, Educational and Academic Outreach Coordinator, Kelsey Museum of Archaeology, University of Michigan. New to the Kelsey last year, Catherine received her PhD in archaeology from Bryn Mawr College, Bryn Mawr, Pa.
Conical glass lamp in stand from Karanis, Egypt. Favorite Artifact: Conical glass lamp in wooden stand. Glass and wood. 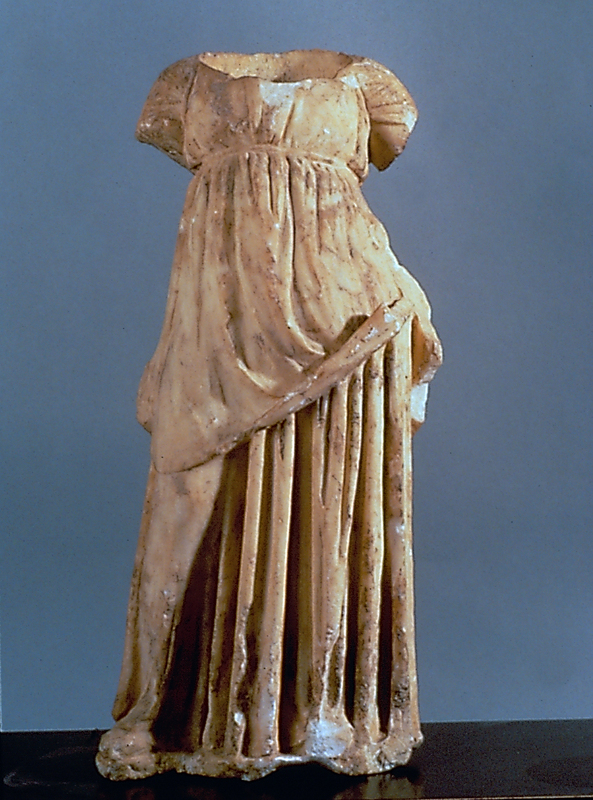 Roman period (1st–4th century AD). Karanis, Egypt. KM 5929 (lamp), KM 3632 (stand). About Artifact: According to Kelsey publication Karanis: An Egyptian Town in Roman Times, the number of wooden reading stands found in the U-M excavations of 1924–35 indicates that literacy, while by no means universal, had been attained by more than a few. In the dark rooms of Karanis houses, light was provided for reading by various kinds of lamps. Conical lamps such as this one were probably set into tripod holders or suspended on ropes or chains. These lamps, many of which were found at Karanis, would have been filled entirely with oil or with water covered by a thin layer of oil. When ignited the oil would have given a muted but adequate light. The sheer volume of glass discovered in Karanis, over twice as much as at any other single site in Egypt, has led to the assumption that glass was manufactured at Karanis. No definitive evidence was recovered, however, to prove that it was made locally. Background. Museum namesake Professor Francis W. Kelsey began a series of excavations in Egypt that were intended to find artifacts and documents in an archaeological context to illustrate daily life in the Greek and Roman world. These excavations began with the site of Karanis (modern Kom Aushim), extensive ruins of an abandoned town of the Greek and Roman periods. The Karanis excavations uncovered hundreds of homes containing thousands of objects. Much of this material attests to the domestic lives of the people — from this material we know what people ate, worked at, read, and how they lived. The University of Michigan spent eleven seasons at Karanis, where the team unearthed a wealth of material of everyday life. Thousands of these objects were given to the University by the Egyptian government, and the artifacts are now housed at the Kelsey and the papyri in the Papyrus Collection at the University Library . Find It. On the first floor of the William E. Upjohn Exhibit Wing, look for the seated priest near the stairway to the second floor. Facing the statue, turn left, walk toward a trio of female sculptures, then turn left again. You should be facing the three Karanis household exhibit cases. The conical glass lamp in stand is in the right-hand exhibit. Karanis: An Egyptian Town in Roman Times: Discoveries of the University of Michigan Excavation to Egypt (1924–1935), edited by Elaine K. Gazda with new preface and updated bibliography by T. G. Wilfong. Purchase online here. Karanis Revealed: Discovering the Past and Present of a Michigan Excavation in Egypt, edited by T. G. Wilfong with the assistance of Andrew W. S. Ferrara. Purchase online here. In the Field: The Archaeological Expeditions of the Kelsey Museum, edited by Lauren E. Talalay and Susan Alcock. Purchase online here.